Many homeowners used to be apprehensive about incorporating glass into their homes. But glass has come a long way over the years and is now a staple inside of many houses. Homeowners are finding all kinds of creative ways to work glass into the mix. Check out a few creative uses for glass in your home below. More and more people are using glass tiles in their kitchen and bathroom spaces. And it’s not hard to see why. Outside of the fact that glass tiles come in a range of colors, they’re also very strong and waterproof. They will look right at home when you choose the right style of glass tiles for your house. Although you’ll usually find glass railings in commercial spaces as opposed to homes, there are some homeowners who have opted to do away with metal railings and go with glass ones instead. They’ll provide a warmth in your home and deliver a contemporary look you won’t get with many metal railing options. You can also choose to go all the way and add a glass staircase to your home, too. Most Americans have fallen in love with the open concept design that makes houses feel bigger. Glass coffee and dining tables play right into that as they open up a space while also proving to be plenty functional. Your home will look more spacious as a whole when you have glass furniture in it. While you’ll probably want to choose glass doors that have been frosted to provide you with privacy, many people are opting to hang glass doors in their homes. They add a modern touch and will make your home feel more open once they’re in place. 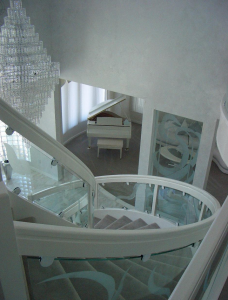 If you would like to find a creative way to work glass into your home, Bent Glass Design would love to help. Call us at 215-441-9101 today to see how you can take advantage of our specialty glass services.